These two should look alike. I would also like to recognize the teaching of my parents as well as my grandparents who depended on the birds that come to Atka for subsistence. It was from them that I first learned the names of the birds, what they eat, where they are found, the songs they sing, and how to catch some of them for food. I am grateful for their teachings. I hope that through reading this book and doing some of the activities that are suggested in 'A Note to Teachers', the students of Atka will be able to know more about the birds that come to their island, and to other islands of the Aleutian Chain throughout the year either for the purpose of nesting or simply to avoid the long winter months of the more northern regions of Alaska. 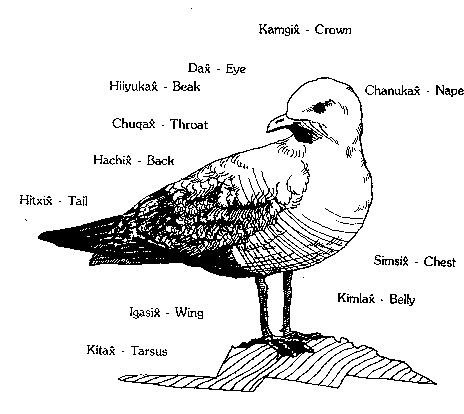 This book, Atkan Birds, is written about the birds that Moses Dirks can definitely identify in Native for Atka island. There may be others that he is not aware of and which some of the activities that are suggested below should help identify. The most important thing to remember when studying this book is that no limitation of study to birds of Atka only is intended. You should encourage the students to find out about other bird species especially those that are found throughout Alaska. One of the best guides on what to do for bird study in Alaska is the booklet that was compiled by the Anchorage Audubon Society, Inc. It is called A Guide to the Audubon Alaskan Birds Chart. If you do not have a copy of it, you should get one. The activities suggested in it are the very ones that can make your bird study not only interesting but very informative. The address for the Anchorage Audubon Society, Inc. is P.O. Box 1161, Anchorage, Alaska 99510. Other information on birds and bird sanctuaries can be obtained by writing to the U.S. Fish and Wildlife Service and the Alaska Department of Fish and Game in Anchorage, Alaska. Perhaps your students could make it a project to write to these agencies including the Educational Services Department, National Audubon Society, 950 Third Avenue, New York, N.Y. 10022. Look over pictures of the birds and identify them both in English and in the Native language. Two good books for this activity are Roger Tory Peterson's new Field Guide to the Birds published by Houghton Muffin Company, Boston, and A Guide to the Birds of Alaska by Robert Armstrong and the Editors of Alaska Magazine which can be purchased from the Book Cache in Anchorage. Sometimes the Native people give examples of how different birds sing their songs. Perhaps it would be very interesting to compare the Native bird sound words to those in the English language, but it would definitely be more interesting to record the bird song as imitated by the Native people and compare them to actual bird songs recorded by you and your students, or played by a recording of such songs made by the Laboratory of Ornithology, Cornell University. These recordings can be used with the Field Guide to the Birds. The National Audubon Society has also produced a set of materials called the Audible Audubon. These consist of a microphonograph and a set of cards containing a color picture of the bird on one side and the information about the bird and its call on a microphonograph record on the other side. The bird songs, or calls, on these microphonograph records are the same ones found on the three 12-LP records mentioned previously. Both have their advantages and disadvantages in terms of using them with students. The Audible Audubon is quite limited in the number of birds that are common to Alaska. Perhaps it would be best to select the ones from the 12-LP records that are typically Alaskan birds and record them on cassettes for student use. Use the counter on the cassette recorder to indicate where different bird songs are found on the tape so that the students can easily locate them. Help the students to identify the birds in their local area by the songs of those birds. Have a bird song identifying contest. Compile the list of names given by the Native people from the community and compare them with your known list to see if there are any new birds to be added to your list. Tell stories of birds and their significance in the people's life history. Help students to learn the stories, and in some cases, there will also be story songs sung by birds for different purposes that students can learn. Some of the stories may be concerned mainly with the beliefs of the people about the behavior of certain birds and how they bring luck, or even misfortune, upon the people. Teach bird dances to the students. Show different methods by which birds were killed for food in the old days. These may include catching birds by nets, trapping, or snaring. Help the students to learn these methods and to make the necessary gear for bird hunting. Tell of how the people worked out ways of ensuring that the bird population is not decreased by foolish hunting. Discuss the effects of hunting laws on the traditonal hunting of birds and why these laws are necessary for the proper management of our bird resources. Have students make a list of the current endangered bird species in Alaska. After the list is made, write short articles on the birds giving the reasons why they are on the endangered species list. The word that means a group of birds nesting in close association. Name at least four types of bill adaptations. Name the Alaska State bird. Tell what you can do to help with bird banding. Name at least four of the National Wildlife Refuges in Alaska. These cards can be used in many different ways. Consider using them for games that are similar to cards used in "Sorry" or "Monopoly." One other way to use them is to divide them into two stacks. Divide the students into two groups. Draw concentric circles on the chalkboard. Starting with the innermost circle, assign points to each circle such as 30, 25, 20, 15, etc. Use rubber darts to shoot at the circles. After the dart lands within one of the circles, the shooter picks up a card and reads it out loud. A member of his group has the first chance to give the correct answer. If he misses, a member of the opposing team can give the answer. If he answers correctly, the shooter's team loses the number of points assigned to that circle to the other team. They also lose their turn to shoot the rubber dart. Keep a tally of points accumulated by each team. Tally the points at the end to determine the winner. Encourage students to be involved in determining how new proposed building projects in the local area, whether they be for residential purposes, highways or industrial use, are going to affect bird habitats. These are only a few suggestions. They can be expanded and added to as the needs and interests of your class are considered. And hopefully, this little book will be of some use to your class in the study of birds. There are lots of birds that can be seen around Atka and near it. There are some birds that are present all year round, and there are some that stay only part of the year. There are winter birds and summer birds. I am going to give their names in Aleut and English, and in that way, we will know the names in both languages.